Today I have a little special feature for you. 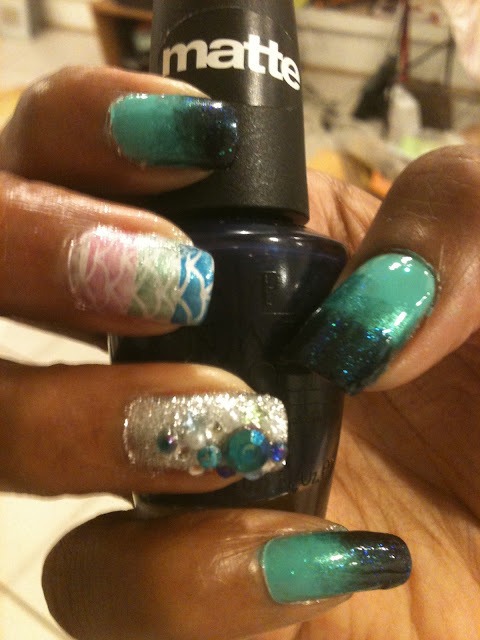 I had a party with my friends L and N - a nail art and makeup party and boy did we have a blast! I did everyone's nails - just not my own and it was fun fun fun fun fun! (Note: Please do not misconstrue my excitement for mania). I learned some great lessons along the way too. Mainly - do not wear a manicure on your nails if you don't want it to get shredded while doing someone else's nails. 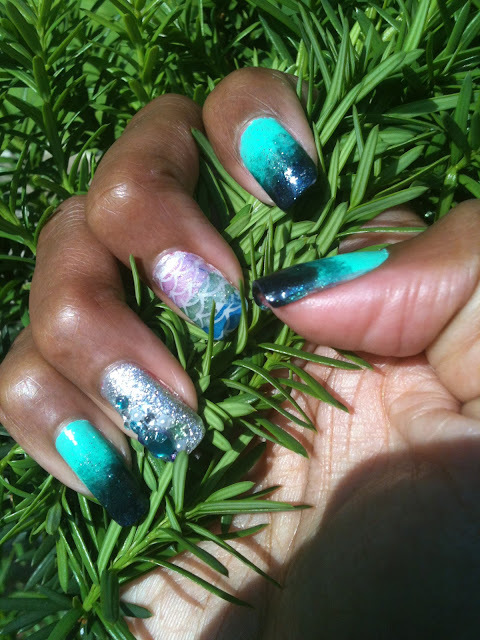 Secondly - soak off gel polish is a you-know-what to get off with pure acetone despite what some nail techs may say. Third, it's hard to take a decent picture of another person's nails - no idea why though! Tips tips? 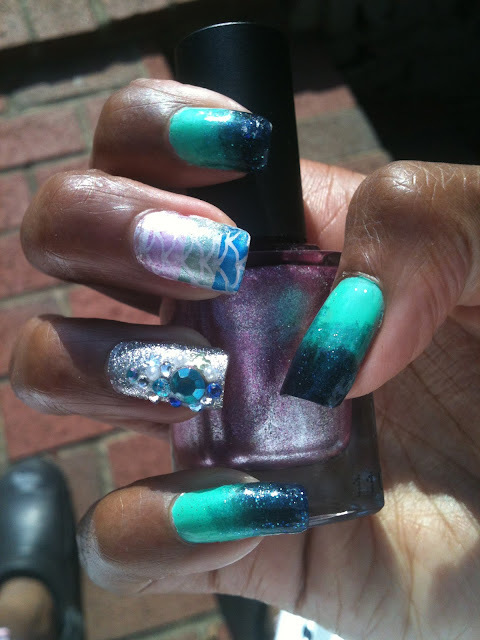 Here are pics of my nails with the manicures as well as my friends. A bit different from my mermaid mani, but after I did L's I started to get ideas! N was suffering from the same cuticle issues so I smeared them down with Vit E oil. I didn't recreate this mani exactly either when I re-did it on myself. 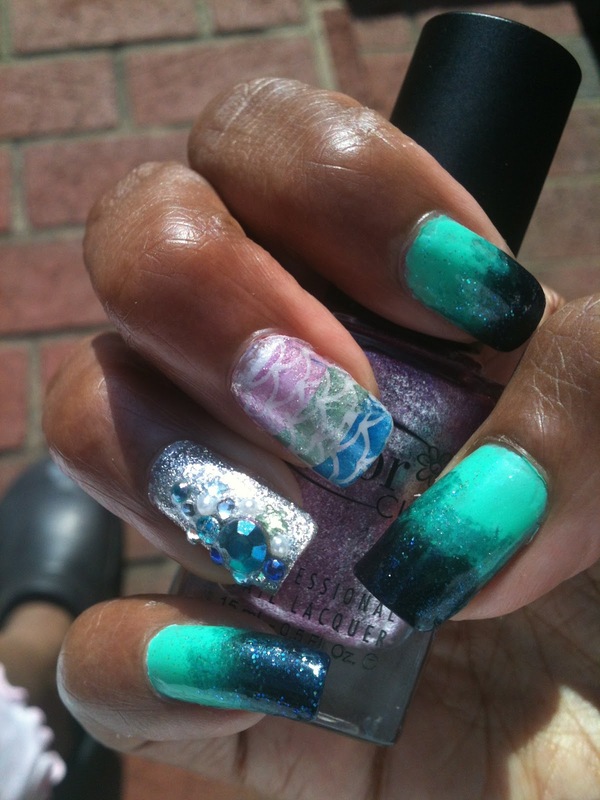 It's hard to see but I have that SH Pacific Blue layered under Lynnderella's Violette de Blue and Forget me Not. I really love this picture plus N and L are so damn tall. Love both of these girls to death and I had such a blast doing their nails! My recreation of L's nails below - it's like her original manicure on crack! This shimmer on the scaled nails is the reason why I love love love Color Clubs Foiled Collection for stamping! The bling of Nail's Inc Electric Avenue is a stunner even without embellishment. I put up the tutorial for L's nails on YT. See the video below to check it out to see the products I used and to get the same fabulous look! N's tutorial is in the works. This was so much fun I know I'll have to do it again sometime soon. Let me know what you ladies think and thanks for reading! Indie Polish Haul Bottle Spam + Ebay finds! I'm back and here to stay + Fairy Manicure!